Instrumentation: Male and female voices. 20 Oct 79: Young Roller Flour Mill, Young, Lambing Flat, NSW.. 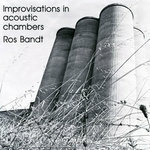 Featuring John Griffiths, Ros Bandt.